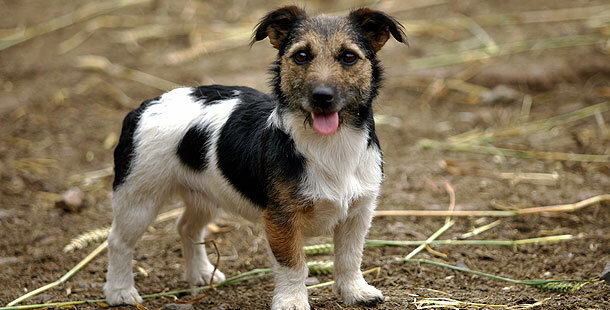 Some conditions are directly related to the features breeders have sought to perpetuate among their dogs. As they deliberately manipulated the appearance of dogs to create or accentuate physical characteristics that were considered aesthetically pleasing, like the flat face of a bulldog or low-slung eyelids of a Bloodhound, breeders also created physical disabilities. The excessively wrinkled skin of the Chinese Shar-Pei causes frequent skin infection; Bulldogs and other flat-faced (or brachycephalic) breeds such as the Pekingese have breathing problems because of their set-back noses and shortened air passages; Bloodhounds suffer chronic eye irritation and infection. The unnaturally large and small sizes of other breeds encourage different problems. For example, toy and miniature breeds often suffer from dislocating kneecaps and heart problems are more common among small dogs. Giant dogs such as Mastiffs, Saint Bernards, and Great Danes are nearly too big for their own good. Researchers have found a striking correlation between a dog’s large size and a frequency of orthopedic problems like hip dysplasia. Large dogs are often prone to heat prostration because they can’t cool down their bodies (tiny dogs, by contrast, have a hard time staying warm), and because of the massive weight they must support, these breeds are prone to malignant bone tumors in their legs. Meanwhile, the huge head and narrow hips of the Bulldog can necessitate that their pups must be born by Caesarean section. Other health problems among purebreds are the product of both inbreeding and bad genetic luck. The genes responsible for many genetic diseases are “recessive,” which means that two copies of a damaged gene, one from the mother and one from the father, must be present in an individual for the disease to occur. Individuals that carry only one copy of the disease gene don’t have the condition, and are carriers of the disease. Normally, because disease genes are relatively rare, it is unlikely that both the mother and the father will be carriers, and even less likely that they’ll both give the disease gene to their offspring. But that’s not the case for purebred dog breeds, where genetically similar individuals are intentionally mated, increasing the concentration of disease genes. It’s like stacking a deck of cards with ten extra aces and ten extra face cards; the loaded deck increases your chance of hitting blackjack in a game of 21-but what you “win” might be allergies or a predisposition to cancer. 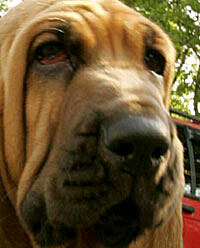 Bloodhounds suffer chronic eye irritation and infection. A skin allergy, atopic dermatitis, inflicts itchy, inflamed skin on as many as 15 percent of all dogs, but certain breeds are particularly susceptible. Dog breeds prone to atopic dermatitis include Dalmatians, Vizslas, and several terriers, such as the Boston Terrier, Bull Terrier, and the West Highland White Terrier. The numerous skin folds of a Chinese Shar-Pei, so valued by some breeders, can become breeding grounds for staphylococcus and other bacteria, which cause frequent skin infections. Also, excess wrinkles of skin on the face can rub on the eye, causing lesions and, potentially, blindness. In autoimmune disorders, an individual’s immune system, which normally works to fight off foreign invaders, launches a misguided attack against its own tissues and cells. A number of inherited diseases compromising the immune system have been noted in dogs, including primary severe combined immunodeficiency (a dog version of the “bubble boy” disease) among Basset hounds, Cardigan Welsh Corgis, and Dachshunds. Addison’s disease, an autoimmune disease that affects the hormone-producing adrenal glands, occurs more frequently among several particular breeds, including the Bearded Collie, Portuguese Water Dog, and Standard Poodles. Diabetes mellitus, an autoimmune disorder affecting the body’s response to sugars, shows up more frequently among Samoyeds and Australian Terrier dogs. Bassett Hounds are prone to an inherited abnormality the effects the ability of the platelets in the blood to clump together after an injury. The blood doesn’t clot properly, leading to hemorrhage and bruising. Clotting problems also plague dogs with von Willebrand’s disease, a genetic condition frequent in Doberman Pinschers. Neurological and behavioral problems afflict many pure breeds. Bull Terriers, for example, often compulsively chase their tails. Pugs are be predisposed to Pug Dog encephalitis, a fatal brain disease. Scottish Terriers are affected by Scottie Cramp, a disorder that causes the dogs to lose muscle control when they get excited. German Shepherds may inherit degenerative myelopathy, a crippling spinal cord disease that causes weakness and eventually paralysis. Hereditary hearing loss is common in Dalmatians, Australian Cattle Dogs, and English Setters. Alaskan Malamutes, Siberian Huskies, Samoyeds, Bichon Frise, and more than 60 other purebred dogs suffer from inherited forms of cataracts, while progressive retinal atrophy, a common cause of blindness in purebreds, is particularly a problem in Old English Sheepdogs and Papillons. Sudden death from cardiac disease is recurrent in several dog breeds, including Doberman Pinschers, Great Danes, Irish Wolfhounds, and German Shepherds. Boxers can be genetically predisposed to an irregular heartbeat. High blood pressure afflicts many small breeds including Poodles, Cocker Spaniels, Staffordshire terriers, among others. Low thyroid function crops up most frequently in Alaskan Malamutes, English Setters, Golden Retrievers, Keeshonds, Samoyeds, and Siberian Huskies. Gastric torsion, or bloat, a potentially life-threatening inability to expel gas from the digestive system, is common among deep-chested breeds such as the Great Dane, Doberman, and German Shepherd. An inherited form of kidney disease affects English Cocker Spaniels, while Dalmatians are prone to kidney stones and Basenjis suffer from Fanconi Syndrome, a potentially fatal inherited disease in which the kidneys fail to reabsorb nutrients. Liver damage and cirrhosis are common in Bedlington Terriers because of an inherited condition called copper toxicosis, in which high levels of copper accumulate in the liver. Cancers are strongly influenced by genetics, and so it is not surprising to find various types of cancer among different dog breeds. For example, bone cancer, or osteosarcoma, is considerably more frequent among large and giant breeds of dogs, such as the Irish Wolfhound, Great Dane, Rottweiler, Labrador and Golden Retriever, Greyhound, and Saint Bernard, because their bones are stressed by carrying so much weight. High rates of malignant blood vessel tumors are seen among Golden Retrievers, which are also prone to leukemia and brain tumors. German Shepherd Dogs and Chow Chows are predisposed to gastric cancer, while Scottish Terriers are 18 times more likely to develop bladder cancer than are other breeds. Hip dysplasia, in which looseness in the hip joint causes excessive wear that eventually leads to arthritis, is most common among large dogs, especially those like the German Shepherd Dog and the Saint Bernard which have heavy, broad hips. The long neck and large head of breeds such as the Great Dane and the Doberman can cause the compression of the spinal cord in neck vertebrae, leading to wobbling and falling (“wobbler syndrome”). Selective breeding of the disproportionately short legs of breeds such as the Basset Hound and the Dachshund has led to bowed legs and chronic problems with elbow dislocation; the short legs and long back of Dachshunds causes them to suffer more often from ruptured vertebral disks. Because of their small bones, toy and miniature breeds are more likely to experience patellar luxation, the slipping or dislocation of the kneecaps.